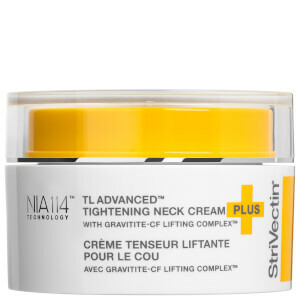 Defy gravity with StriVectin TL Advanced Tightening Neck Cream Plus, an upgraded version of the bestselling anti-aging formula. Powered by a Gravitite-CF Lifting Complex™ to firm and tighten the neck contours, the moisturizer works to enhance elasticity in order to smooth the appearance of wrinkles and minimize sagging. Patented NIA-114™ technology strengthens the skin barrier against the damaging effects of free radicals, whilst a botanically-derived Brightening Complex helps to balance the skin tone around the décolleté. Expect a smoother, firmer and younger-looking neck contour with a visibly healthy glow. Apply to clean skin in the morning and night. Apply a thin layer to front of neck. Gently massage into skin with an upward motion. Apply along jawline and sides of neck. Massage into décolleté in a circular motion.